"Brilliant personal touches that will really engage children in early literacy learning." "We LOVE this app! 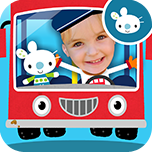 Our favorite of the Wheels on the Bus apps by far." "My toddler loves playing with this. It's so cute for him to identify himself as the bus driver." "Lovely graphic style and excellent interactivity. Additional bonus for me was gentle music." 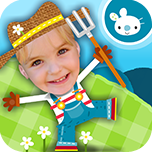 "I love that you can add pictures & create your own characters. 5/5 VERY highly recommended." 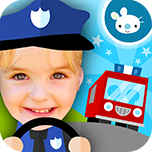 "Definitely one of the best apps for pre-school kids." "I LOVE it, I have a couple other Wheels on the Bus apps & this is the cutest." "As a Teacher... It's so refreshing to find an app as amazing as this." 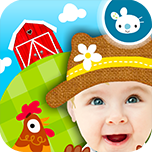 "Another super app from OkiPlay - so cute to customize with personal picture." RECOMMENDED app in The Literacy Trust app guide for young children. Be the star in this best selling preschool nursery rhyme. 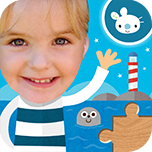 Sing along & play memory games and shape matching puzzles. No 3rd party ads, no data-gathering and COPPA compliant.